Hello, I wasn't sure if this was the right forum for this question; but here goes. I just moved to Pittsburgh with both of my kitties. It was a four and a half hour trip. They are adjusting ok. I think I'm about to move again, because things aren't working out here at all. I'm planning on going back to Palm Springs, CA. It will be a good "coming home" for me. Here is my problem, I don't know what to do concerning my babies. I'm flying back to Cali. My aunts are going to take the kitty I took in a couple of years ago. She knows them and would love it where they're at out in the country. That is pretty much settled. My big concern is for my other baby. We've been together for 7 years since she was a kitten. I actually found her in Palm Springs. I've moved several times since then, she's been with me every step of the way. So, to my question, do you think I should take her back with me on the plane. I'll be in a house with 4 other cats, so there would be a definite period of adjustment. I would probably have to leave her in the room most of the time until she adjusted to the other cats or I got my own place. I'm going to be very busy when I get there. I'm afraid I won't have as much time to spend with her as I usually do. I just want what is best for her. I've thought of taking her to animal friends here in pitt. It's a no kill adoption shelter for kitties. I don't know if that would be more traumatic for her than the plane trip/new living situation or not. She would go to a good stable home if I took her to animal friends, but would losing me be too difficult for her? I don't know what to do. I want what is best for her. Please help!!!! well folks, I've reached a decision, I love my babies too much to rehome them. I'm going to take them both back to the country with me. I wouldn't have been able to live with myself otherwise. They truly did choose me to take care of them for their entire life. And that's what I'm going to do. I don't think Palm Springs is the right decision. If I cant take both of my babies; I know it's not. Please, please, PLEASE do not fly the cats! 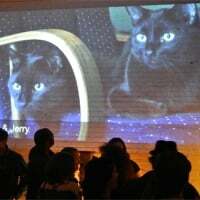 Jack the Cat was lost at a NY airport when his mom was flying him and her other cat to CA; after 61 days in the CEILING of a building (where they'd not been allowed to look), he fell out. He spent several days in ICU, but his injuries and malnutrition were more than his body could handle, and he had to be sent to the Bridge. Please look into ground transport for you kids. Check it out on Facebook: Where is Jack the Cat? And best of luck to you; it is SO good that you've decided to keep your kids with you! I know this is an old thjread, but Althea brings up a point I like to make ...the cats 'shipped as cargo don't ever come out of their crates or go into the airport itself, so I'm thinking Jack was lost when he went thru security--you have to get out of the crate and be carried through when the crate is scanned. When we fly Meowma always puts a harness and leash on us, at home and makes sure it is well fitted....puts her hand through the leash loop when we are carried thru the security oint. That way if we were tofreak out, she would still have ahold of the leash--of course us Burms don't freak out Akitty that might probably needs a little pill from the vet before flying. After being pressured to give up a kitty many years ago (28) I can tell you that it still haunts me to this day & I feel that I failed her. I cry & and feel I should have pushed harder to keep her - even though I fought. Do what you have to in order to keep your kitties. Unless it is due to a health issue or totally impossible, it will hurt too much. Jack the Cat was lost when a careless and irresponsible worker let his carrier fall from a cart (on which it had been placed way too high). The crate broke apart, and Jack, terrified of course, ran off. Many, many, MANY people looked for him, but the airline was not as cooperative as they should have been and would not allow them to look in certain places. It was a horrific experience for all concerned. If it is possible to transport them by ground, that is far preferable. It must be terrifying to be in the belly of a plane, all alone, with the noise, vibrations, etc. I would not subject my kids to such torture. Anyone considering flying their cat(s) as cargo should really read this; it was written by the sister of Jack's human, who is devoting her life to increasing the safety of air travel for pets. PLEASE read this, and then visit the website www(dot)jackthecat(dot)org. This is what MaryBeth wrote: Yesterday, we recognized and honored the second anniversary of Jack "going missing" - an understated way of saying that American Airlines illegally stacked the crates that he and Barry were traveling in, Jack's crate fell and opened, and he took off and went into hiding. Since that day, a huge amount of my time has been devoted to learning about all the ways that air travel is currently unsafe for animals, and thinking about ways to change that. Over the course of the last 2 years, we have learned that there are not one, not two, but at least FOUR relevant players in creating safer air travel for pets: Airlines: they were our first focus and they continue to be extremely important, especially for pets who are flying in cargo. (And yes, I believe that no animal should fly in cargo, but we're nowhere even close to that point.) There is NO AIRLINE ACCOUNTABILITY for the vast majority of animals who currently fly in cargo. These animals are flown as "commercial cargo" - generally by commercial breeders who have sold their animals either to an individual or to a retailer (read: puppy store). If one of these animals is lost, injured or killed, the airlines do not report the incident under the law as it is currently written. These laws are currently being reconsidered and Where Is Jack? Inc. has weighed in strongly on this matter. The bureaucratic wheels are turning slowly, but we know that all comments have been read and the Department of Transportation is moving forward toward changing how airlines report on animals lost, injured and killed while in their care. In many cases, it is not actual airline employees but SUBCONTRACTORS who handle animals who are flying in cargo. As was made clear in the case of Lynn Jones in Reno, most baggage is handled by employees of smaller companies - thus relieving the airlines themselves of the requirements of training workers and insuring that any LIVE ANIMAL who is transported via checked baggage or cargo is handled appropriately. This makes our work much more difficult - it is not just a few airlines we need to deal with, but literally hundreds of small companies hired by the airlines. The companies themselves are frequently changed, and there is high turnover within each company (as is generally the case with minimum wage jobs). Advocating for high quality animal transport within this system turns out to be extremely difficult. Airport Management: before Jack went missing, I had never even given a thought to who - if anyone - manages the airport as a whole. Turns out this a a whole industry unto itself!! And guess what -- it's even more complicated than the airline industry!!! Airports can be managed by quasi-governmental organizations (like the Port Authority of New York & New Jersey, which manages JFK, LaGuardia and Newark airports); they can be managed by cities (like the Philadelphia airport); they can be managed by private companies; and they can be managed by some combination of all of these (example: JFK airport is managed as a whole by the Port Authority, but Terminal 4 is managed by a private company (JFKIAT, LLC). Why does this matter? If you have an animal lost anywhere in the airport, you are going to have to deal with airport management. And some management structures are much easier to deal with than others. TSA: The Transportation Safety Administration screening process is THE SINGLE ENTITY THAT EVERYONE TRAVELLING WITH A PET is going to have to deal with, whether your pet is traveling with you in-cabin or flying as checked baggage or cargo. And TSA has absolutely positively no responsibility if something goes wrong and your pet gets loose during the screening process. We first learned about this hazard with the case of Xiaohwa, and this has been a focus of our attention for most of the last year. We have been in contact with TSA, advocating that they change their procedures so that private screening is mandated for all animals. We also want everyone to know that this is a vulnerable point for anyone travelling with an animal, and we seek to educate travelers so they can take appropriate action to keep their pet safe during the TSA screening process. The Federal Bureaucracy (especially the Department of Transportation (DoT) and the Federal Aviation Administration (FAA) and the Department of Justice (DoJ, which implements the Americans with Disabilties Act): The DoT determines the reporting requirements for airlines transporting pets - thus (currently) giving the airlines the ability to obfuscate how many animals really are lost injured or killed. The FAA will let you buy a seat for your cello, but won't let you buy a seat for a dog crate that won't fit under the seat. The Americans with Disabilities Act governs the rules surrounding not only service animals but emotional support animals - which allows many people to travel with animals that are too big to fit under the seat. In short - there are many parts of the U.S. national government which have some say in how animals are treated when they fly. And when we put all this information together, what we learn is this: it is very difficult to get anyone to take REAL RESPONSIBILITY if an animal is injured or killed while flying. And if an animal is lost - like Jack was - it's going to take incredible effort to just get through the bureaucracy to search.